In many parts of life, more is better, but when it comes to operating an engine based hydraulic power unit, that is not the case. By using the pressure reading it is easy to find the sweet spot for any particular pumping situation. Specifically, the pressure shown on the gauge is an indication of the amount of work being done by the hydraulic motor on the pump head. The higher the pressure, the harder the motor is working. 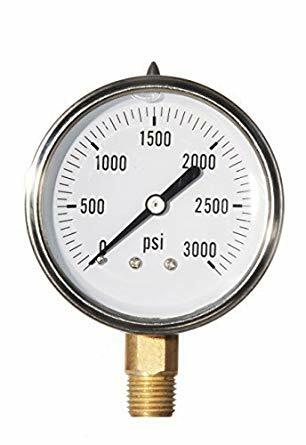 This working pressure profile can vary for different styles of pumps, but the one thing that is the same across the board is this… when adjusting engine rpm the operator will see system pressure rising until it stops. When the needle stops moving, it means that given the current set up, the system is at its most efficient point. Attempting to increase engine speed in an effort to get more submersible pump flow will only result in burning more fuel; it will not change the gpm output of the head. Of course, as conditions change, that ideal point will change too, so further adjustments will be required to stay at the best spot. By educating your customers and staff about this pressure point, it becomes a win, win, as fuel costs can be cut, wear and tear on engines is reduced and the environmental impact of the fuel burn is minimized. Because hydraulic systems are fairly simple, they tend to react in the same way when something goes wrong. When using hydraulic power to drive a pump head, we look at three sides to the same problem to find the reason why the pump head is not moving water. If the submersible is not moving water, the operator should first note the pressure reading shown on the gauge on the high pressure side of the system. If the HPU is good, the next thing to check for is lack of water in the pump. Is the suction opening and/or the strainer base clogged? If the suction is not clogged, the pump may not be submerged enough to begin working. Generally speaking the pump should be in water that reaches to the bottom of the hydraulic motor. Once you know if the HPU is good, and the suction side is clear and the pump is submerged enough, it is possible that the pump is air bound. This can even occur with a pump that is continually sitting in water. If none of the above are true, then it is likely worn parts. The hydraulic motor could be washed out and the oil when under pressure is blowing by instead of doing the work. Or, there may be excessive wear at the impeller and internal parts which is greatly reducing the efficiency of the pump head. While troubleshooting can sometimes be a headache with hydraulic pumping systems, going through the process detailed above usually uncovers the cause of the problem. If it does not, feel free to call us, and a member of our staff will be happy to work through to a solution. Check out the support tab on our website for other useful technical information about our pumps and hydraulic power units.